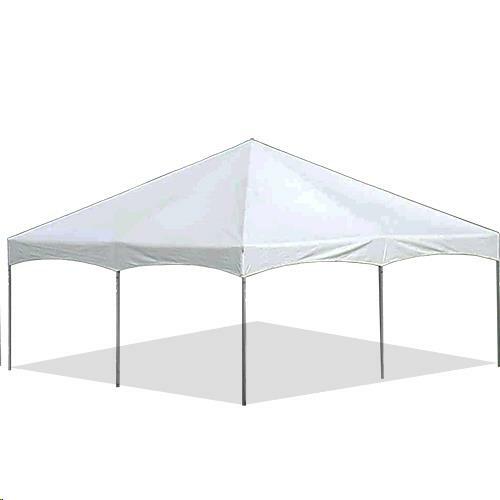 20' x 20' White Party Canopy. 7 ft. side height x 12 ft. 6 in peak height. Up to 50 people in a cocktail party setting (some setting, some standing). This canopy will fit 3 rows of 2 - 8' banquet tables w/ chairs. Comes with 20' x 20' canopy, 9 poles (20 sections), and 13 steel ground stakes. Make sure the area is level, free of underground hazards and overhangs. Severe weather can damage this canopy. If severe weather is expected, take down the canopy and store it in a safe area. STAKE PLUG, ASPHALT 7/8-1 1/4"
* Please call us with any questions about our canopy 20 foot x 20 foot white in Oak Grove MO, Blue Springs MO, Independence MO, Lexington MO, Odessa MO, Independence MO and Western Missouri.